Clovis (Latin: Chlodovechus; reconstructed Frankish: *Hlōdowig; c. 466 – November 27, 511) was the first king of the Franks to unite all of the Frankish tribes under one ruler, changing the form of leadership from a group of royal chieftains to rule by a single king and ensuring that the kingship was passed down to his heirs. He is considered to have been the founder of the Merovingian dynasty, which ruled the Frankish kingdom for the next two centuries. Clovis is important in the historiography of France as "the first king of what would become France". Clovis was born a pagan but later became interested in converting to Arian Christianity. Clovis is significant due to his conversion to Christianity in 496, largely at the behest of his wife, Clovis' wife Clotilde, a Burgundian princess, was a Catholic despite the Arianism that surrounded her at court who would later be venerated as a saint for this act, she is still celebrated today in both the Roman Catholic Church and Eastern Orthodox Church. 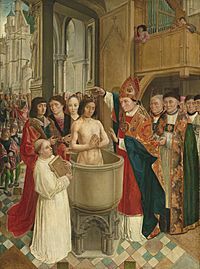 Clovis was baptized on Christmas Day in 508. 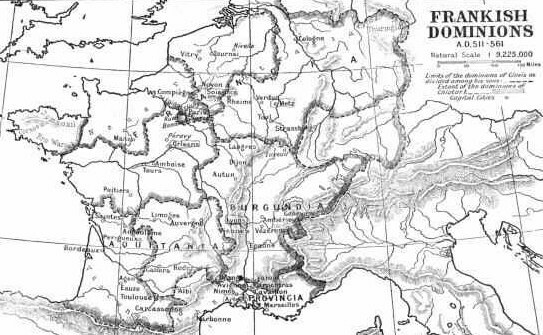 The adoption by Clovis of Catholicism (as opposed to the Arianism of most other Germanic tribes) led to widespread conversion among the Frankish peoples. Clovis and his wife were buried in the Abbey of St Genevieve (St. Pierre) in Paris; the original name of the church was the Church of the Holy Apostles. Medal with obverse legend "Clovis Roy de France"
Clovis I Facts for Kids. Kiddle Encyclopedia.